Dentures (also known as false teeth) are prosthetic devices constructed to replace missing teeth, and are supported by the surrounding soft and hard tissues of the oral cavity. Conventional dentures are removable (removable partial denture or complete denture). However, there are many denture designs, some which rely on bonding or clasping onto teeth or dental implants (fixed prosthodontics). There are two main categories of dentures, the distinction being whether they are used to replace missing teeth on the mandibular arch or on the maxillary arch. Dentures do not feel like real teeth, nor do they function like real teeth. Denture stomatitis is an inflammatory condition of the skin under the dentures. It can affect both partial and complete denture wearers, and is most commonly seen on the palatal mucosa. Clinically it appears as simple localized inflammation (Type 1), generalized erythema covering the denture-bearing area (Type II) and inflammatory papillary hyperplasia (Type III). People with denture stomatitis are more likely to have angular cheilitis. Denture stomatitis is caused by a mixed infection of Candida albicans (90%) and a number of bacteria like Staphylococcus, Streptococcus, Fusobacterium and Bacteroides species. Acrylic resin is more susceptible for fungal colonisation, adherence and proliferation. Denture trauma, poor denture hygiene and nocturnal denture wear are local risk factors for denture stomatitis. Systemic risk factors for denture stomatitis include nutritional deficiencies, immunosuppression, smoking, diabetes, use of steroid inhaler and xerostomia. A person should be investigate for any underlying systemic disease. Improve the fit of ill-fitting dentures to eliminate any dental trauma. Stress on the importance of good denture hygiene including cleaning of the denture, soaking the dentures in disinfectant solution and not wearing it during sleeping at night is the key to treat all types of denture stomatitis. Topical application and systemic use of antifungal agents can be used to treat denture stomatitis cases that fail to respond to local conservative measures. Mouth ulceration is the most common lesions in people with dentures. It can be caused by repetitive minor trauma like poorly fitting dentures including over-extension of a denture. Pressure indicating paste can used to check the fitting of dentures. It allows the areas of premature contact to be distinguished from areas of physiologic tissue contact. Therefore, the particular area can be polished with acrylic bur. Leaching of residual monomer methylmethacrylate from inadequately cured denture acrylic resin material can cause mucosal irritation and hence oral ulceration as well. Advise the person to use warm salt water mouth rinses and a betamethasone rinse can heal ulcer. Review of persisting oral ulcerations for more than 3 weeks is recommended. People can become entirely edentulous (without teeth) for many reasons, the most prevalent being removal due to dental disease, which typically relates to oral flora control, i.e., periodontal disease and tooth decay. Other reasons include pregnancy, tooth developmental defects caused by severe malnutrition, genetic defects such as dentinogenesis imperfecta, trauma, or drug use. Periodontitis is defined as an inflammatory lesion mediated by host-pathogen interaction that results in the loss of connective tissue fibre attachment to the root surface and ultimately to the alveolar bone. It is the loss of connective tissue to the root surface that leads to teeth falling out. The hormones associated with pregnancy increases the risk of Gingivitis and vomiting. Hormones released during pregnancy softens the cardia muscle ring that keeps food within the stomach. Hydrochloric acid is the acid involved in gastric reflux, also known as morning sickness. This acid, at a pH of 1.5-3.5 coats the enamel on the teeth; at a pH of 6.5 and mainly affect the palatal surfaces of the maxillary teeth, eventually the enamel is softened and easily wears away. Dental trauma refers to trauma (injury) to the teeth and/or periodontium (gums, periodontal ligament, alveolar bone). Strong force may cause the root of the tooth to completely dislocate from its socket, mild trauma may cause the tooth to chip. Can be made for either partial but mainly complete denture patients. These dentures require fewer visits to make and usually are made for older patients, patients who would have difficulty adjusting to new dentures, would like a spare pair of dentures or like the aesthetics of their dentures already. This requires taking an impression of the patients current denture and remaking them. 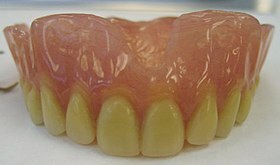 Dentures are mainly made from acrylic due to the ease of material manipulation and likeness to intra-oral tissues, ie. gums. Most dentures made are fabricated from heat-cured acrylic polymethyl methacrylate and rubber-reinforced polymethyl methacrylate. Coloring agents and synthetic fibers are added to obtain the tissue-like shade, and to mimic the small capillaries of the oral mucosa, respectively. However, dentures made from acrylic can be fragile and fracture easily if the patient has trouble adapting neuromuscular control. This can be overcome by reinforcing the denture base with cobalt chromium (Co-Cr). They are often thinner (therefore more comfortable) and stronger (to prevent repeating fractures). Carved ivory dentures from the 18th century. Left is lower/mandibular; upper/maxillary is at right. 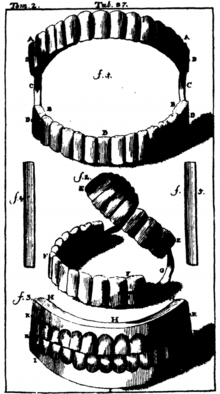 Pierre Fauchard described the construction of dentures using a metal frame, animal bone teeth, and leaf springs in 1728. In 1820, Samuel Stockton, a goldsmith by trade, began manufacturing high-quality porcelain dentures mounted on 18-carat gold plates. Later dentures from the 1850s on were made of Vulcanite, a form of hardened rubber into which porcelain teeth were set. In the 20th century, acrylic resin and other plastics were used. In Britain, sequential Adult Dental Health Surveys revealed that in 1968 79% of those aged 65–74 had no natural teeth; by 1998, this proportion had fallen to 36%. George Washington (1732–1799) suffered from problems with his teeth throughout his life, and historians have tracked his experiences in great detail. He lost his first adult tooth when he was twenty-two and had only one left by the time he became president. He had several sets of false teeth made, four of them by a dentist named John Greenwood. None of the sets, contrary to popular belief, were made from wood or contained any wood. The set made when he became president were carved from hippopotamus and elephant ivory, held together with gold springs. Prior to these, he had a set made with real human teeth, likely ones he purchased from "several unnamed Negroes, presumably Mount Vernon slaves" in 1784. 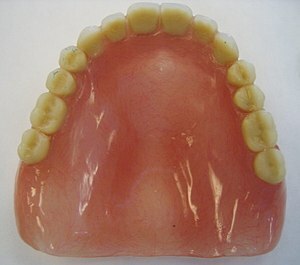 Processing a denture is usually performed using a lost-wax technique whereby the form of the final denture, including the acrylic denture teeth, is invested in stone. This investment is then heated, and when it melts the wax is removed through a spruing channel. The remaining cavity is then either filled by forced injection or pouring in the uncured denture acrylic, which is either a heat cured or cold-cured type. During the processing period, heat cured acrylics—also called permanent denture acrylics—go through a process called polymerization, causing the acrylic materials to bond very tightly and taking several hours to complete. After a curing period, the stone investment is removed, the acrylic is polished, and the denture is complete. The end result is a denture that looks much more natural, is much stronger and more durable than a cold cured temporary denture, resists stains and odors, and will last for many years. Retention is the principle that describes how well the denture is prevented from moving vertically in the opposite direction of insertion. The better the topographical mimicry of the intaglio (interior) surface of the denture base to the surface of the underlying mucosa, the better the retention will be (in removable partial dentures, the clasps are a major provider of retention), as surface tension, suction and friction will aid in keeping the denture base from breaking intimate contact with the mucosal surface. It is important to note that the most critical element in the retentive design of a maxillary complete denture is a complete and total border seal (complete peripheral seal) in order to achieve 'suction'. The border seal is composed of the edges of the anterior and lateral aspects and the posterior palatal seal. The posterior palatal seal design is accomplished by covering the entire hard palate and extending not beyond the soft palate and ending 1–2 mm from the vibrating line. Generally speaking partial dentures tend to be held in place by the presence of the remaining natural teeth and complete dentures tend to rely on muscular co-ordination and limited suction to stay in place. The maxilla very commonly has more favorable denture bearing anatomy as the ridge tends to be well formed and there is a larger area on the palate for suction to retain the denture. Conversely, the mandible tends to make lower dentures much less retentive due to the displacing presence of the tongue and the higher rate of resorption, frequently leading to significantly resorbed lower ridges. Disto-lingual regions tend to offer retention even in highly resorbed mandibles, and extension of the flange into these regions tends to produce a more retentive lower denture. An implant supported lower denture is another option for improving retention. Dentures that fit well during the first few years after creation will not necessarily fit well for the rest of the wearer's lifetime. This is because the bone and mucosa of the mouth are living tissues, which are dynamic over decades. Bone remodeling never stops in living bone. Edentulous jaw ridges tend to resorb progressively over the years, especially the alveolar ridge of the lower jaw. Mucosa reacts to being chronically rubbed by the dentures. Poorly fitting dentures hasten both of those processes compared to the rates with well-fitting dentures. Poor fitting dentures may also lead to the development of conditions such as epulis fissuratum. In addition, the occlusion (chewing surfaces of the teeth) tends to wear away over time, which reduces chewing efficacy and decreases the vertical dimension of occlusion, (the "open-ness" of the jaws and mouth). A low-cost denture starts at about $300–$500 per denture, or $600–$1,000 for a complete set of upper and lower dentures. These tend to be cold cured dentures, which are considered temporary because of the lower quality materials and streamlined processing methods used in their manufacture. In many cases, there is no opportunity to try them on for fit before they are finished. They also tend to look artificial and not as natural as higher quality, higher priced dentures. A mid-priced (and better quality) heat cured denture typically costs $500–$1,500 per denture or $1,000-$3,000 for a complete set. The teeth look much more natural and are much longer lasting than cold cured or temporary dentures. In many cases, they may be tried out before they are finished to ensure that all the teeth occlude (meet) properly and look esthetically pleasing. These usually come with a 90-day to two-year warranty and in some cases a money-back guarantee if the customer is not satisfied. In some cases, the cost of subsequent adjustments to the dentures is included. Premium heat cured dentures can cost $2,000-$4,000 per denture, or $4,000-$8,000 or more for a set. Dentures in this price range are usually completely customized and personalized, use high-end materials to simulate the lifelike look of gums and teeth as closely as possible, last a long time and are warranted against chipping and cracking for 5–10 years or longer. Often the price includes several follow-up visits to fine-tune the fit. In the United Kingdom, as of 13 March 2018, an NHS patient would have to pay £244.30 for a denture to be made. This is a flat rate and no additional charges should be made regarding material used or appointments needed. Privately, these can cost upwards of £300. Daily cleaning of dentures is recommended. Plaque and tartar can build up on false teeth, just as they do on natural teeth. Cleaning can be done using chemical or mechanical denture cleaners. Dentures should not be worn continuously, but rather left out of the mouth during sleep. This is to give the tissues a chance to recover, and wearing dentures at night is likened to sleeping in shoes. The main risk is development of fungal infection, especially denture-related stomatitis. Dentures should also be removed while smoking, as the heat can damage the denture acrylic and overheated acrylic can burn the soft tissues. Deposits such as microbial plaque, calculus and food debris can accumulate on the dentures, which may lead to issues such as angular stomatitis, denture stomatitis, undesirable odours and tastes as well as staining. The deposits can also quicken the rate at which some of the denture materials wear down. Due to the presence of these deposits, there is an increased risk of the denture wearer and other people around them developing a systemic disease by organisms such as methicillin-resistant Staphylococcus aureus (MRSA), but research shows that denture cleaners are effective against MRSA. Therefore, denture cleaning is imperative for the overall health of the denture wearers as well as for the health of people they come into contact with. After receiving dentures, the patient should brush them often with soap, water and a soft nylon tooth brush which has a small head, as this will enable the brush to reach into all the areas of the denture surface. The bristles need to be soft in order for them to easily conform to the contours of the dentures for adequate cleaning, whereas stiff bristles will not be able to conform very well and are likely to cause abrasion of the denture acrylic resin. If a patient finds it difficult to utilise a toothbrush e.g. patients with arthritis, a brush with easy grip modifications can be used. Disclosing solutions can be used at home to make the less obvious plaque deposits more visible to ensure thorough cleaning of plaque. Food dyes can be utilised as a disclosing solution when used correctly. Instead of brushing their dentures with soap and water, patients can use pastes designed for dentures or conventional toothpaste to clean their dentures. However, the American Dental Association advises against using toothpaste since it can be too harsh for cleaning dentures. Patients should combine the brushing of their dentures with soaking them in an immersion cleaner from time to time as this combined cleaning strategy has been shown to control denture plaque. Due to microbial invasion, the lack of use of immersion cleaners and inadequate denture plaque control will cause rapid deterioration of the soft linings of the denture. Liquid cleansers that dentures can be immersed in include: bleaches e.g. sodium hypochlorite; effervescent solutions e.g. alkaline peroxides, perborates and persulphates; acid cleaners. Sodium hypochlorite (NaOCl) cleansers have a disinfectant action and they remove non-viable organisms and other deposits from the surface, but they are not very good at eliminating calculus from the denture surface. Immersing dentures in a hypochlorite solution for more than 6 hours occasionally will eliminate plaque and heavy staining of the denture. Furthermore, as microbial invasion is prevented, the deterioration of the soft lining material does not occur. Although, corrosion of cobalt chromium has occurred when hypochlorite cleansers have been used and they may also result in the fading of the acrylic and silicone lining, but the softness or elastically of the linings are not greatly changed. Effervescent cleansers are the most popular immersion cleansers and include alkaline peroxides, perborates and persulphates. Their cleansing action occurs by the formation of small bubbles which displace loosely attached material from the surface of the denture. They are not very effective as cleansers and have a restricted ability to eliminate microbial plaque. Moreover, they are safe for use and do not cause deterioration of the acrylic resin or the metals used in denture construction. Despite this, they are able to cause rapid damage to some short-term soft lining. Discolouration of the acrylic resin to a white denture often occurs, however, this happens because patients do not follow the manufacturer’s instructions and often add very hot water to the cleaning agent. Sulphamic acid is a type of acid cleanser that is used to prevent the formation of calculus on dentures. Suphlamic acid has a very good compatibility with many denture materials, including the metals used in denture construction. 5% hydrochloric acid is another type of acid cleanser. In this case, the denture is immersed in the hydrochloric cleanser to soften the calculus so that it can be brushed away. The acid can cause damage to clothes if accidentally spilt and could cause corrosion of cobalt-chromium or stainless steel if immersed in the acid often and over long periods of time. Other denture cleaning methods include enzymes, ultrasonic cleansers and microwave exposure. A Cochrane Review found that there is weak evidence to support soaking dentures in effervescent tablets or in enzymatic solutions and while the most effective method for eliminating plaque is not clear, the review shows that brushing with paste eliminates microbial plaque better than inactive methods. There is a need for studies to provide reports about the cost of materials and the negative effects that may be associated with their use as these factors could affect the acceptability of such materials by patients which will in turn affect their effectiveness in a daily setting in the long term. Additionally putting dentures into a dishwasher overnight can be a handy short cut when away from home. Additionally, further studies comparing the different methods of cleaning dentures are needed. ^ a b Puryer, James (2016-07-02). "Denture stomatitis – a clinical update". Dental Update. 43 (6): 529–535. doi:10.12968/denu.2016.43.6.529. ISSN 0305-5000. ^ Pinelli, L. A. P.; Montandon, A. A. B.; Corbi, S. C. T.; Moraes, T. A.; Fais, L. M. G. (2013-02-26). "Ricinus communistreatment of denture stomatitis in institutionalised elderly". Journal of Oral Rehabilitation. 40 (5): 375–380. doi:10.1111/joor.12039. ISSN 0305-182X. ^ "Traumatic Ulcers" (PDF). NHS. ^ "Dental Directory : Pressure Indicating Paste (PIP)". www.dental-directory.co.uk. Retrieved 2019-03-08. ^ M. Millwaters; Bhamrah, G. (September 2008). "Denture ulcerations". British Dental Journal. 205 (6): 297. doi:10.1038/sj.bdj.2008.815. ISSN 1476-5373. ^ "Head and Neck Cancers". NHS Scotland Primary Care Cancer Referral Guidelines. Retrieved 2019-03-08. ^ Milward, P.; Katechia, D.; Morgan, M. Z. (November 2013). "Knowledge of removable partial denture wearers on denture hygiene". British Dental Journal. 215 (10): E20. doi:10.1038/sj.bdj.2013.1095. ISSN 1476-5373. PMID 24231889. ^ Mitchell, David A.; Mitchell, Laura; Brunton, Paul (2005). Oxford handbook of clinical dentistry (4th ed.). Oxford University Press. ISBN 978-0-19-852920-0. OCLC 58598367. ^ Sakaguchi, Ronald L.; Powers, John M. (2012). Craig's Restorative Dental Materials (13th ed.). ISBN 978-0-323-08108-5. ^ Chalifoux, Paul R. (2015). "Acrylic and other resins: Provisional restorations". Acrylic and other resins: Provisional restorations - Esthetic Dentistry (Third Edition) - 10. pp. 197–230. doi:10.1016/B978-0-323-09176-3.00019-X. ISBN 9780323091763. Retrieved 2018-06-08. ^ a b c d Moriyama, N.; & Hasegawa, M. (1987). "The history of the characteristic Japanese wooden denture". Bulletin of the History of Dentistry. 35 (1): 9–16. PMID 3552092. ^ a b Donaldson, J. A. (1980). "The use of gold in dentistry" (PDF). Gold Bulletin. 13 (3): 117–124. doi:10.1007/BF03216551. ^ British Journal of Dental Science, Volume 4. IV (62):p.208. London: John Churchill. August 1861. Retrieved March 15, 2017. ^ "Dental art: A French dentist showing his artificial teeth". British Dental Association. 30 June 2010. Archived from the original on 6 November 2011. ^ "The Henry J. McKellops Collection in Dental Medicine". ^ Eden S. E.; Kerr W. J. S.; Brown J. (2002). "A clinical trial of light cure acrylic resin for orthodontic use". Journal of Orthodontics. 29 (1): 51–55. doi:10.1093/ortho/29.1.51. PMID 11907310. ^ Murray JJ (Nov 2011). "Adult dental health surveys: 40 years on". Br Dent J. 211 (9): 407–8. doi:10.1038/sj.bdj.2011.903. PMID 22075880. ^ Lloyd, John; Mitchinson, John (2006). The Book of General Ignorance. New York: Harmony Books. p. 97. ISBN 978-0-307-39491-0. Retrieved July 3, 2011. ^ Earls, Stephanie (22 February 2014). "Re-enactor brings George Washington to life". The Washington Times. Retrieved 21 March 2014. ^ Glover, Barbara (Summer–Fall 1998). "George Washington—A Dental Victim". The Riversdale Letter. Retrieved June 30, 2006. ^ Choices, NHS. "What is included in each NHS dental band charge? - Health questions - NHS Choices". www.nhs.uk. Retrieved 2018-03-13. ^ Basker, R M; Davenport, J C; Thomason, J M (2011). Prosthetic Treatment of the Edentulous Patient (5th ed.). John Wiley & Sons Ltd, West Sussex, UK: Wiley-Blackwell. pp. 214–217. ^ Glass, R; Goodson, L; Bullard, J; Conrad, R (2001). "Comparison of the effectiveness of several denture sanitizing systems". Compendium of Continuing Education in Dentistry. 22 (12): 1093–6. ^ Lee, D; Howlett, J; Pratten, J; Mordan, N; McDonald, A; Wilson, M; Ready, D (2009). "Susceptibility of MRSA biofilms to denture-cleansing agents". FEMS Microbiology Letters. 291 (2): 241–6. doi:10.1111/j.1574-6968.2008.01463.x. PMID 19146578. ^ Maeda, Y; Kenny, F; Coulter, W; Loughrey, A; Nagano, Y; Goldsmith, C; Millar, B; Dooley, J; James, S; Lowery, C; Rooney, P; Matsuda, M; Moore, J (2007). "Bactericidal activity of denture-cleaning formulations against planktonic healthcare-associated and community-associated methicillin resistant Staphylococcus aureus". American Journal of Infection Control. 35 (9): 619–22. doi:10.1016/j.ajic.2007.01.003. PMID 17980242. ^ Murakami, H; Mizuguchi, M; Hattori, M; Ito, Y; Kawai, T; Hasegawa, J (2002). "Effect of denture cleaner using ozone against methicillin-resistant Staphylococcus aureus and E. coli T1 phage". Dental Materials Journal. 21 (1): 53–60. doi:10.4012/dmj.21.53. PMID 12046522. ^ Basker, R M; Davenport, J C; Thomason, J M (2011). Prosthetic Treatment of the Edentulous Patient (5th ed.). John & Wiley Sons Ltd, West Sussex, UK: Wiley-Blackwell. pp. 214–217. ^ a b c d e f g h i Basker, R M; Davenport, J C; Thomason, J M (2011). Prosthetic Treatment of the Edentulous Patient. John & Wiley Sons Ltd, West Sussex, UK: Wiley-Blackwell. pp. 214–217. ^ "American Dental Association - Removable Partial Dentures". www.mouthhealthy.org. Retrieved 2018-12-17. ^ Paranhos, H; Silva-Lovato, C; Souza, R; Cruz, P; Freitas, K; Peracini, A (2007). "Effect of mechanical and chemical methods on denture biofilm accumulation". Journal of Oral Rehabilitation. 34 (8): 606–12. doi:10.1111/j.1365-2842.2007.01753.x. PMID 17650171. ^ Basker, R M; Davenport, J C; Thomason, J M (2011). Prosthetic Treatment of the Edentulous Patient. John & Wiley Sons Ltd, West Sussex: Wiley-Blackwell. pp. 214–217. ^ Davenport, J C; Wilson, H J; Spence, D (1986). "The compatibility of soft lining materials and denture cleansers". British Dental Journal. 161 (1): 13–17. doi:10.1038/sj.bdj.4805880. PMID 3460611. ^ Harrison, A; Basker, R M; Smith, I (1989). "The compatability of temporary soft materials with immersion denture cleansers". International Journal of Prosthodontics. 2: 254–8. ^ Crawford, C A; Lloyd, C M; Newton, J P; Yemm, R (1986). "Denture bleaching: a laboratory simulation of patients' cleaning procedures". Journal of Dentistry. 6 (3): 239–46. PMID 279578. ^ Robinson, J G; McCabe, J F; Storer, R (1987). "Denture bases: the effects of various treatments on clarity, strength and structure". Journal of Dentistry. 15 (4): 159–65. doi:10.1016/0300-5712(87)90143-6. PMID 3478378. ^ De Souza, Raphael Freitas; De Freitas Oliveira Paranhos, Helena; Lovato da Silva, Claudia H; Abu-Naba'a, Layla; Fedorowicz, Zbys; Gurgan, Cem A (7 October 2009). "Interventions for claning dentures in adults". Cochrane Library (4): CD007395. doi:10.1002/14651858.CD007395.pub2. PMID 19821412.